Kutchi Dabeli also called Kuchchi Dabeli or Double Roti or just Dabeli. Kutchi Dabeli is a very popular street food of India. Kutchi Dabeli originated from Kutch or Kachchh region of Gujarat. 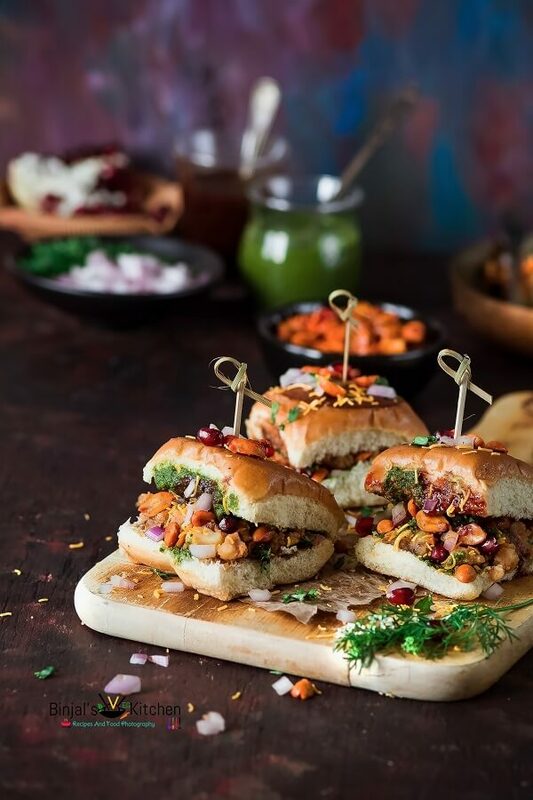 It is a spicy snack item made it from boiled potatoes with a special dabeli masala, and putting the mixture between the pav/burger bun and served with chutneys, onion, spicy peanut, sev, etc……. 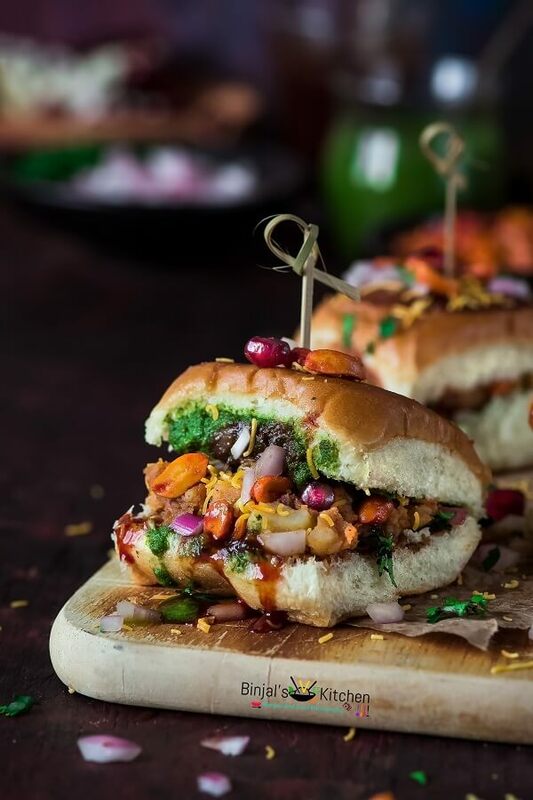 Kutchi Dabeli is a one kind of Indian flavored burger or sandwich you can say that. It has all Indian street food chaat flavor in one burger like sweet, sour, spicy with sev, chutneys totally mouthwatering. All ingredients are good enough just to tempt you. Traditionally, when it invented, before bun/pav started to use in India, it would serve in thick but soft roti that’s why they named it double roti, but after bun/pav introduced to India, bun took the place of traditional roti and now it is permanently replaced. Ok, so today here is I’m sharing one of my fav street food of India (Gujarat) Kutchi Dabeli……. 1. Roast the peanuts on low flame till all sides become light brown or it takes around 4-5 mins, then remove it on a plate and keep aside to cool down. 2. Remove the peanuts skin using your hand palms, clean the peanuts and then halve it. 3. Heat the oil in a kadhai/pan. Add peanuts, red chili powder, chaat masala, salt and sugar and roast it for a minute on low flame. Remove it on the same plate and keep aside for later use. 4. Heat the oil in a pan. 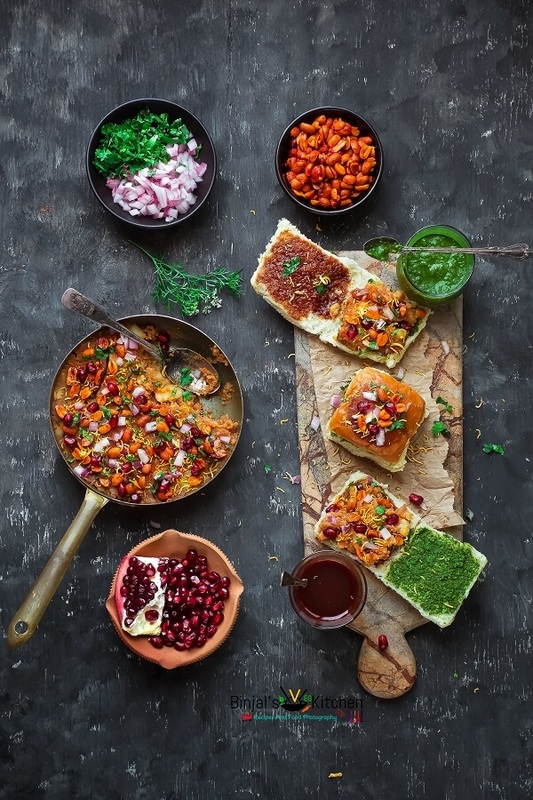 Add homemade dabeli masala, stir it for a few seconds, then add boiled potatoes, mash it using a masher or grate it and mix it till smooth mixture. 5. Add tamarind chutney, salt and ¼ cup water and mix it well and cook it for 3-4 mins on low to medium flame with occasional stirring. 6. Now Potato masala is ready, remove the masala on a plate or bowl and keep aside. 7. Take the bowl of potato masala, spread the masala peanuts, pomegranates, chopped onion, coriander leaves and sev over it. 8. Now take the pav, apply green chutney and tamarind chutney inside the bun (per taste), then stuff the full spoon of the prepared potato masala mixture in it. Do the same process for remaining masala and buns and make more dabelis. 9. Heat the griddle, spread the melted butter over it and arrange the stuffed buns over the griddle and brush the butter on the top and roast both sides of the stuffed buns on low flame till golden brown. 10. Kutchi Dabeli is ready to serve. Now serve it with extra sev, chopped onion or masala peanuts as per your taste and enjoy the taste of street food at home. • You can adjust the Dabeli Masala in the mixture as per your taste. • You can roast the bun first, then stuff the mixture rather than roast it after stuffing. • Skip the pomegranate if you don’t have or don’t like it. • Some street vendors are using sliced green grapes and small pieces of pineapple slices as a topping. So, you can use it if you like it. Roast the peanuts on low flame till all sides become light brown or it takes around 4-5 mins, then remove it on a plate and keep aside to cool down. Remove the peanuts skin using your hand palms, clean the peanuts and then halve it. Heat the oil in a kadhai/pan. Add peanuts, red chili powder, chaat masala, salt and sugar and roast it for a minute on low flame. Remove it on the same plate and keep aside for later use. Heat the oil in a pan. 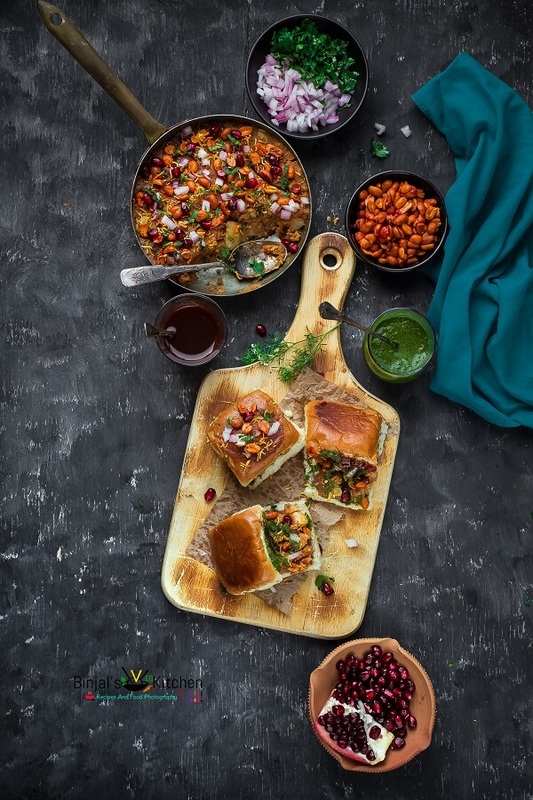 Add homemade dabeli masala, stir it for a few seconds, then add boiled potatoes, mash it using a masher or grate it and mix it till smooth mixture. Add tamarind chutney, salt and ¼ cup water and mix it well and cook it for 3-4 mins on low to medium flame with occasional stirring. Now Potato masala is ready, remove the masala on a plate or bowl and keep aside. Take the bowl of potato masala, spread the masala peanuts, pomegranates, chopped onion, coriander leaves and sev over it. Now take the pav, apply green chutney and tamarind chutney inside the bun (per taste), then stuff the full spoon of the prepared potato masala mixture in it. Do the same process for remaining masala and buns and make more dabelis. Heat the griddle, spread the melted butter over it and arrange the stuffed buns over the griddle and brush the butter on the top and roast both sides of the stuffed buns on low flame till golden brown. Kutchi Dabeli is ready to serve. Now serve it with extra sev, chopped onion or masala peanuts as per your taste and enjoy the taste of street food at home.